Longarm Quilting Basics All Day Hands-on Workshop with Kelly Ashton! This class is the kick off of three full days of classes with Handi Quilter International Educator, Kelly Ashton! Plus we'll be having a weekend of Amazing Prices on new and Demo machine packages, and product discounts on accessories and gadgets! Does longarm quilting interest you, and you'd like to learn more about it? Or do you just want a review of longarm basics? This class removes the mystery of longarm quilting by explaining machine and frame elements and features, how to load a quilt, and vital facts about thread, needles and tension. A great longarm boot camp or refresher class! All class materials will be provided. There will be a break for lunch. Feel free to bring a lunch on the day of class, or there are fast food establishments close by. 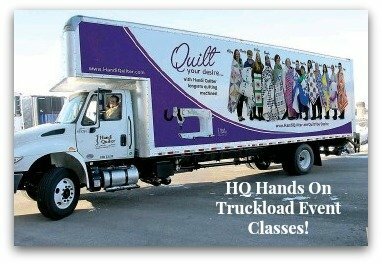 Sign up for as many of the different Truckload Event Classes to create your own Weekend Retreat of Longarm Classes!